The Harvard Flea Market is held on the grounds of the Bromfield School, near the center of Harvard, on Route 111. Take Exit 38A (marked Harvard/Worcester, Route 111 south). 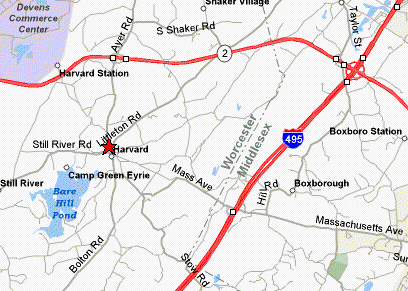 Follow Route 111 south for about two miles to Harvard's center. Continue through the light to the Bromfield School, which will be on the right. Take Exit 28, Route 111 (marked Harvard/Boxborough). Follow Route 111 north for about two miles toward Harvard's center. The Bromfield School will be on the left.